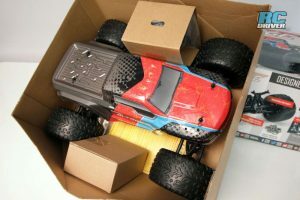 As I walked through a few big box stores over the weekend, I saw a number of toy RC cars that looked pretty interesting. Some were near 1/10 in size, some powered with a respectable battery rather than snapping in some double A’s and I even saw a FPVish looking toy RC. 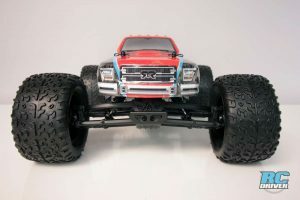 I can certainly see some people turning to these RC vehicles rather than hobby grade. 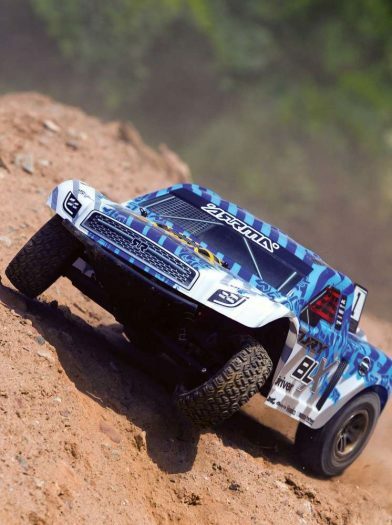 But after looking at the prices, I thought to myself, wow, these are a little pricey and considering there is no part support, it would be a bummer to lose a potential RC enthusiast when the vehicle breaks. I believe many hobby grade manufacturers think the same thing too and some do act on it. 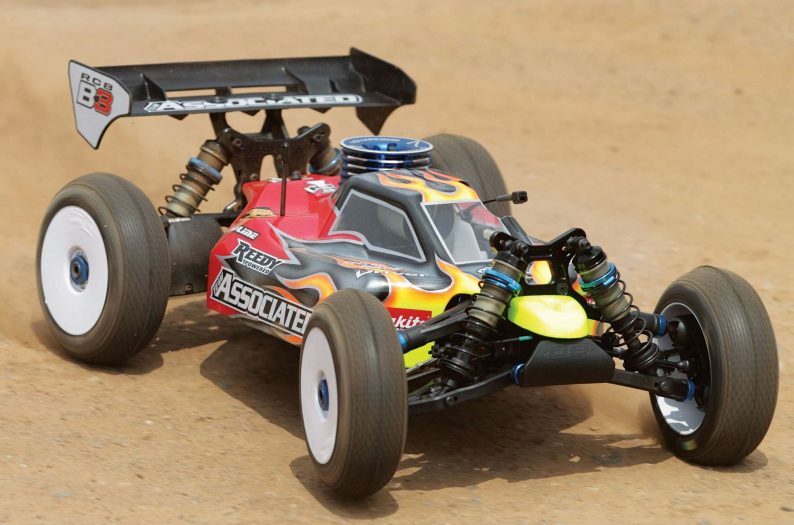 ARRMA has stepped up and has really done something about it with their brand new Voltage series of RC cars. 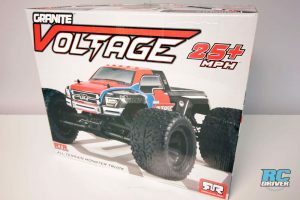 The new Arrma Granite Voltage along with the other offerings in the Voltage series truly does bridge the gap between toy grade and hobby grade RC. 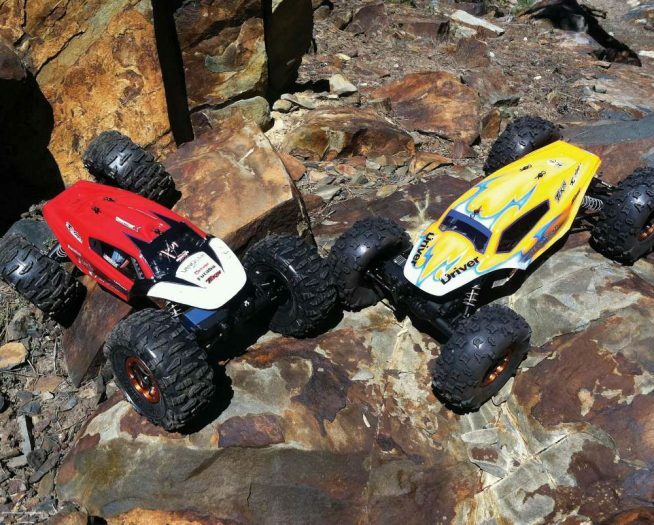 The new Voltage RC machines such as the Granite you are about to see here take some cues from toy grade such as easy of use electronics and price point and mix it together with hobby grade performance, excitement and replaceable parts. 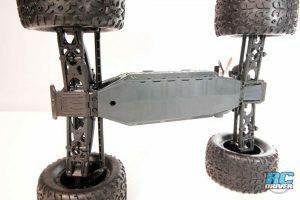 ARRMA has done it in a way that is pretty exciting so let’s talk a little more about what really sets it apart as we unbox the Granite. Let’s get the box out of the way. The Granite comes boxed up in some simple packaging. Cool box art, brief explanation of some neat features on most of the panels and breakdown of their use of Li-Ion batteries, which is a big deal. Inside the box fits tightly around the truck, it’s secured with an additional cardboard panel and the radio and charger are protected by their own cardboard packages. There is a small bag with the manual taped to the bottom of the box along with a bag of a few parts like a tool and shock clips. The chassis is all new to the Granite. 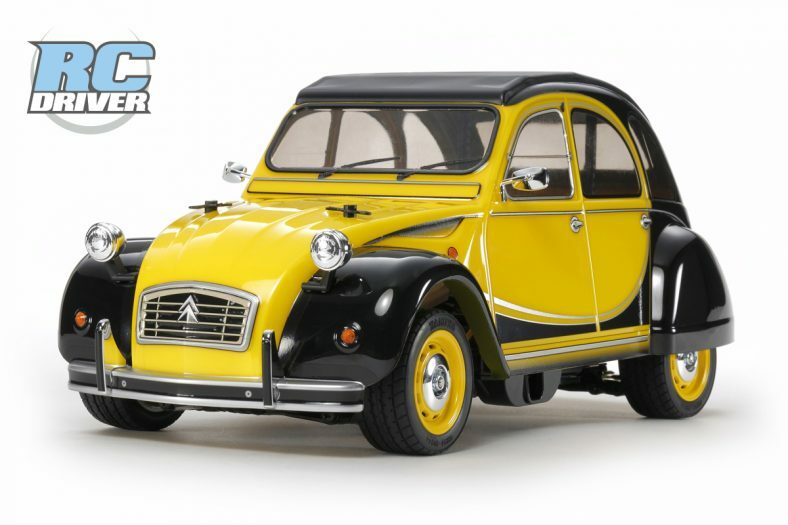 It is a simple monocoque style chassis with the drivetrain integrated into the rear of the unit. Even the motor is located in the center for better balance and protection. The battery case is located in the center and has an easy access door. 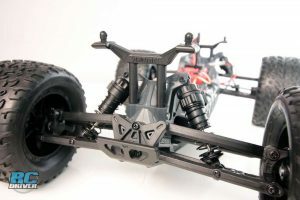 The shock towers are integrated into the chassis and overall the layout is clean and user friendly. 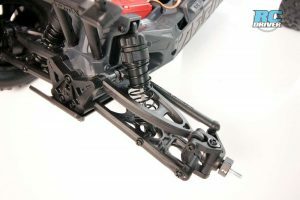 Stiff universal suspension arms are used for both the front and rear lower arms and a wishbone rounds out the upper portion of the front suspension with fixed links found on the steering and in the rear. The shocks are oil-filled and feel very plush from the factory. It appears that the lower pivots can be swapped out in case you do break a pivot rather than an arm in a crash. There isn’t really any adjustability, for the suspension rather than shock oil and adding or removing spring clips, but this is a basic basher and the suspension looks on-point as is. As mentioned, the composite gears for the transmission are located inside the chassis and all spin on ball bearings. 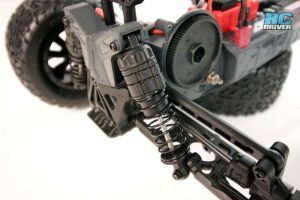 The gear differential is a planetary style with metal internal gears and power is sent to the wheels by steel dogbones. Sorry, there is no slipper clutch here, but the motor is set in a fixed position so there are no worries about setting proper gear mesh. The electronics are somewhat toy like as in they are a 3-in1 unit, but the comparison ends there. 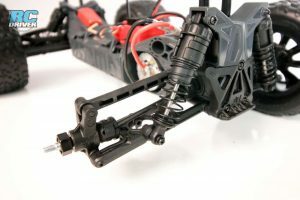 The quality receiver and electronic speed control are all in one box and a 5-wire harness extends to the steering servo. 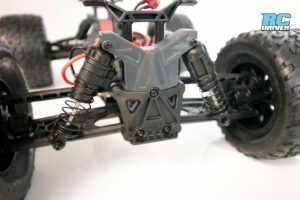 We use three wire harnesses in hobby grade vehicles and it is possible to upgrade to one later by simply plugging a the servo harness into an optional part on the receiver/ESC unit. The radio is a lightweight, somewhat basic 2.4gHz transmitter, but does have trims, reverse switches and a comfy foam grip on the steering wheel. 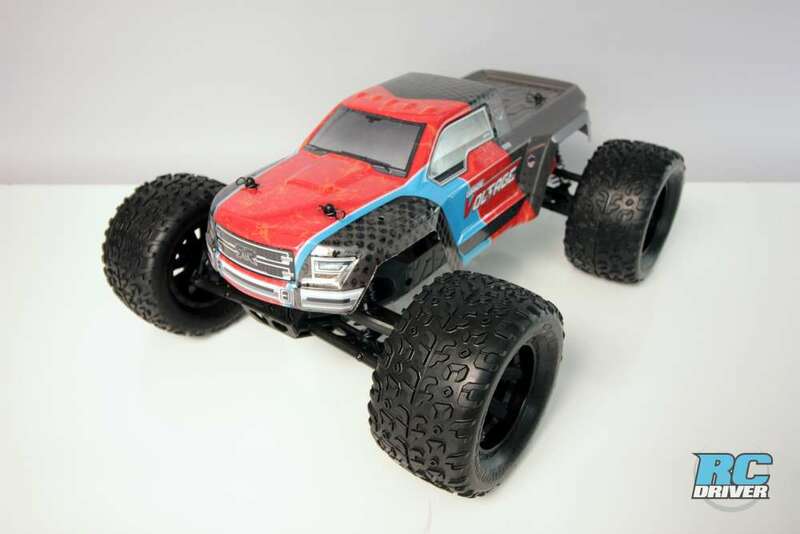 The Granite comes with a prepainted monster truck style body with some neat graphics and a few logo decals. It sits on body posts than can be adjusted by the user, but the factory height is perfect as is. The black spoke rims look great and are wrapped in dBoots Copperhead tires that are great for multi-terrain use. The big wow on this truck is the reason for its name; Voltage. 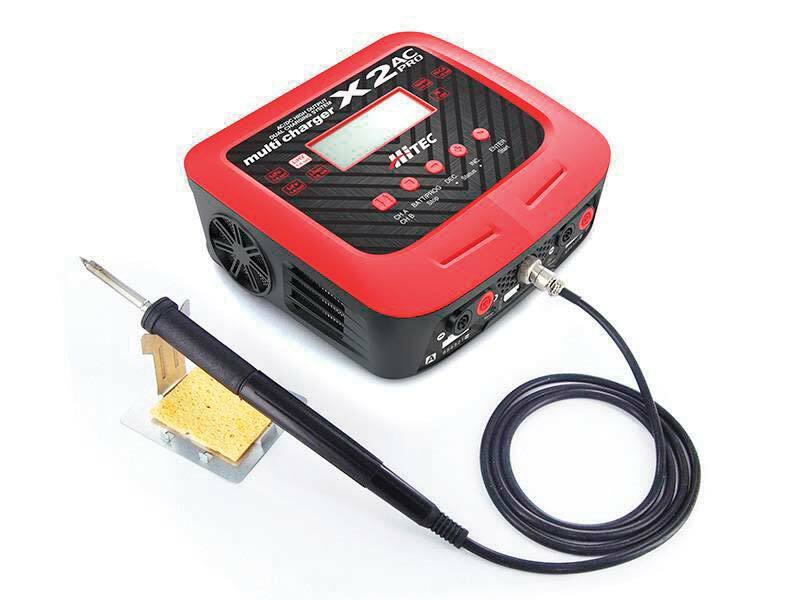 The Granite Voltage is powered by two 3.7v Li-Ion cells. They basically look like oversized AA batteries, but they are far from AA’s. We’ve seen a few toy manufacturers use these on some basic RC cars. These batteries are lightweight, safer than LiPos, easy to charge and easy to install. 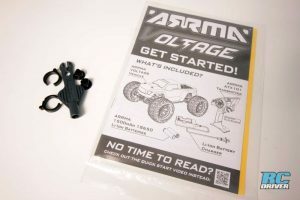 ARRMA includes a basic wall/USB style charger for charging the batteries. 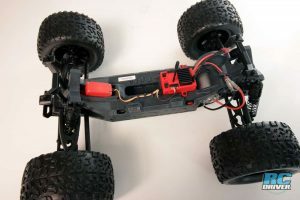 The two Li-Ion 18650 cells when combined together give the truck 7.4v of power with 1500mAh of capacity. 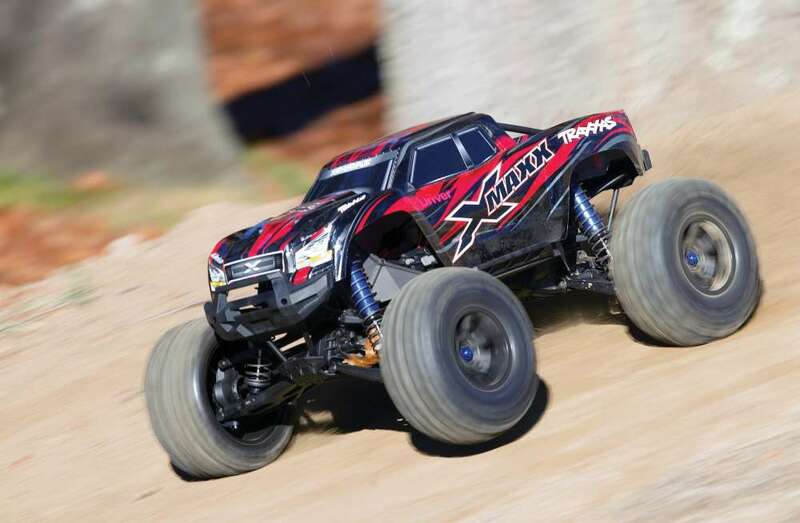 This can propel truck truck up to 25mph out of the box with a run time between 5-9 minutes! Pretty neat right? But there’s more. You can add more of these cells to the battery tray in the Voltage to increase run times. You can add two more cells for up to 18 minutes of run time or four more for up to 27 minutes. Still want more power versatility? 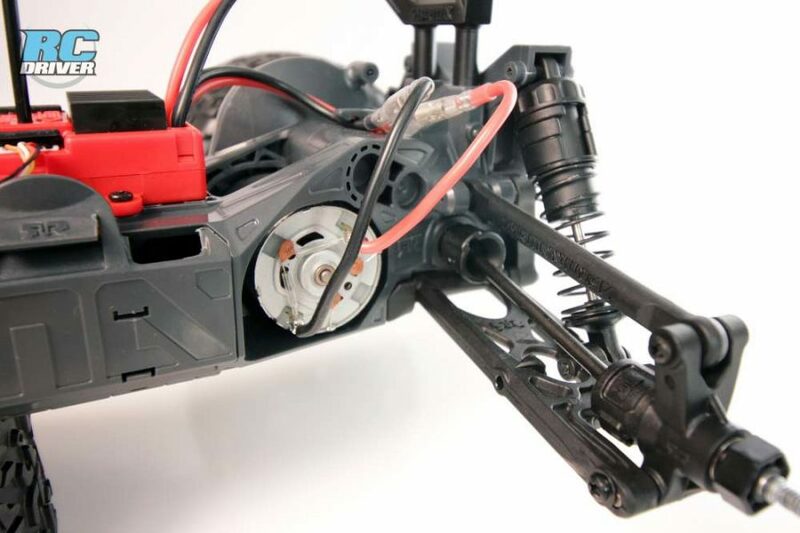 No problem, the Voltage can also run on standard RC 7.2v Nickel Metal-hydride shotgun packs or 7.4v 2S Lithium Polymer packs that are fitted with a high-power T-Plug. All you need to do is move a “jumper” on the speed control that corresponds with the style of battery you are using. So what is our overall impression of the new Voltage during this Unboxing? We’re pretty impressed with what this platform has to offer and it’s versatility in the power department. 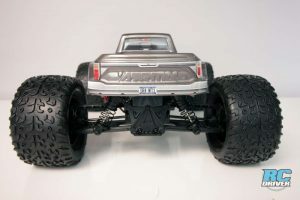 The chassis seems rigid. The suspension appears durable. 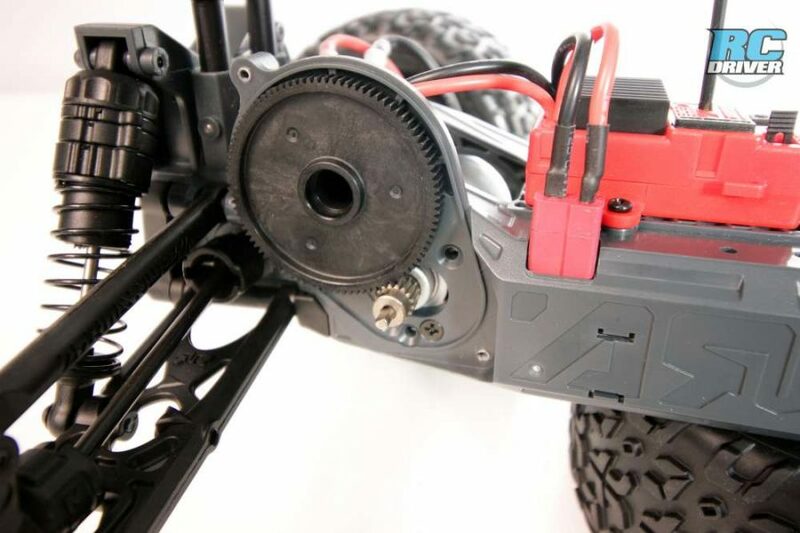 We’re interested to see how the drivetrain holds up and can’t wait to test the power options. 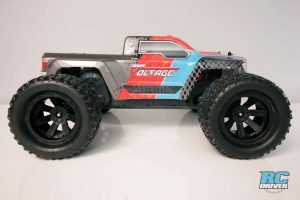 These ARRMA Voltage just may be the perfect introduction to hobby grade RC for so many people that were considering an RC toy.